Transform the way you think about marketing your service business and create professional service experiences your clients will love. Working in a professional advice business is challenging. You work closely with clients and they expect you to deliver them the results they are looking for. Providing value has never been more important as the market place becomes more competitive. Service 7 provides you with 7 principles to help you and your staff create and deliver advice and service that your clients will love. You deliver for today – and for tomorrow. 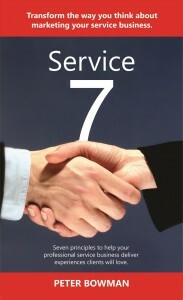 Service 7 is for professional advice providers and business owners. If you’re an accountant, a financial planner, a legal advisor, a mortgage broker or a professional advice provider, Service 7 will help you take a superior offer to the marketplace by delivering a service that your clients will love. Order Service 7 and pay $20.00 AU with free postage worldwide! If you’d prefer to pay by EFT, rather than PayPal, please supply your details using the contact us form, and we’ll issue an invoice by email.